The journey to Trivandrum was on the drawing board for a long time. A family function at Ernakulam, and a short Vacation for college set the scene for my trip to Trivandrum. Choosing the operator was simple – but there still was some dilemma. I badly wanted to try the route via Nagercoil – at the same time, I wanted to travel through the Alappuzha route as well. 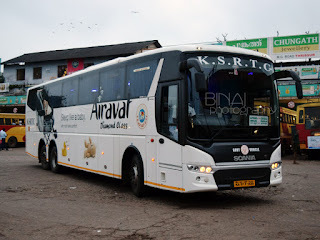 My previous Trivandrum-Bangalore journey was by Kerala SRTC’s Garuda Volvo – which was just months old then. That was a mind blowing journey – there were no multi-axle buses at that time. So this time, I wanted to try the same route in a Multi-axle. The chosen operator was Kallada G4 – tickets were booked through my contact. The journey was initially planned for November 12, but I had to post pone it to November 14. The postponing process was simple – just called up Kallada G4’s office in Irinjalakuda – the person at the other end was very helpful. The ticket was confirmed – however, I did not receive any message. I called up again, and found that they had entered the wrong phone number – but he guaranteed that it was okay. I took an auto from my good friend Jayasankar’s home in Trivandrum to head to Thampanoor. I was dropped near the parking place of Kallada G4 around 1635hrs. The bus was all set to leave. The attendant was known to me – he was elated on seeing me. Boarding was yet to begin since the travel agency’s guy hadn’t come with the charts yet. The driver had gone to the temple (an auspicious start to the journey), while the attendants (yes! There were two of them) were getting ready. The engine was started, and the AC was blowing at full force. An air freshener was sprayed. Boarding started at 1700hrs. The attendant helped passenger with the baggage, while the agent’s guy was helping passengers find their seat. He asked me for my ticket as I got in – I did not have a “ticket”. I told him the seat number (#40) – he checked the chart and verified with my name. He came around later and collected the ticket fare. Sixteen passengers were boarding from Thampanoor. The bus backed out of the parking lot at 1716hrs – the agent’s guy was still in the bus, giving details of pickups to the crew. The bus went towards the railway station, took a “U” turn at the roundabout and headed towards Aristo Junction. The agent’s guy got off as the bus stopped outside the agency. As we started off, I saw SRM’s Bangalore bus preparing to start. 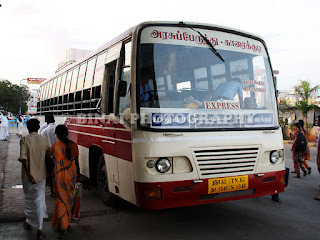 (Megha Travels’ parking was closed due to road works, and the SRM bus was parked in a different ground). The guy in the driver seat was the same guy who drove the bus during the inaugural run. He was well controlled, and was driving really well. The bus was a bit noisy and the transmission had a rubber band effect. The bus directly headed out through Pettah towards the bypass. We stopped at Chakka Junction for a pick-up (1736hrs) – 1 pax joined. There was one foreigner in the bus, who was behaving very weird. He was occupying seat #38. The attendant came around and asked him for his ticket – he replied that he already gave the ticket. The attendant appeared a bit confused – he turned to me and said seat #38 was boarding only at Thrissur. The foreigner was non-cooperative. A couple of us asked him for his ticket or his seat number. The attendant called up the agency to find out if this person was really booked in the bus – they confirmed his booking. Sometime later, the attendant came again, and this time the foreigner threw a piece of paper at him – that was his ticket. The seat number mentioned was #32. Now a few of us had to join the attendant to coerce the fellow to move to his seat. He was behaving even weirdly after moving to his seat – he was banging the window and pulling the curtains at times. In the meantime, the bus stopped at Kazhakoottam for pick-up. One passenger joined in, and we departed at 1755hrs. The traffic was heavy and the driver was struggling to overtake vehicles. There was continuous stream of vehicles in the opposite direction. The bus could not exceed 70kmph at any point of time till we crossed Kollam. There was a small traffic block before Attingal – the crew used this opportunity to intimate the travel agent that the bus was nearby. Attingal was reached at 1818hrs – 4 pax joined in – since the agent was informed in advance, the passengers were ready when the bus reached. Traffic situation continued to worsen as we headed towards Kollam. Overtakes were well planned and well executed – a couple of times we had to stop midway though. A stage show was played on TV after Attingal – while stage shows are a great choice for buses leaving from Bangalore (due to late departure – stage shows would be perfectly timed). This particular program did not have even a single good performer, and almost all the items presented had double meanings/vulgar expressions. The choice of program was bad, IMHO. We reached Kollam at 1915hrs – 2 passengers joined. The second driver also got in here. So now we had two drivers, two attendants and 24 passengers. The bus picked up pace after Kollam – the traffic reduced a bit. The foreigner in the bus was now getting violent – he was banging the overhead rack and even trying to push in his bag on to the speakers! The crew tried controlling him, but he kept shouting out something incoherently in his native language. He calmed down after they reduced the volume of the program shown on TV. We reached Karunagappally at 1953 and picked up one passenger. The next pick-up was Kayamkulam (2013hrs) – three passengers got in. One of the passengers had a seat next to the foreigner – the cleaner quickly adjusted another seat for this passenger. We picked up two more passengers at Haripad (2031hrs). Sometime later, the foreigner behaved even more violently – he jumped off his seat on to the walkway, and shouted some swearwords loudly, banging the roof and the racks. The bus was stopped and other passengers got off – one passenger literally charged on this guy and threatened him to keep quiet or get off the bus. The crew had decided to stop at the next police station to offload this passenger – they did not lose their cool at any point of time (Really appreciate the way the crew behaved). The bus resumed its journey. The foreigner was a bit calm after this – he was not offloaded from the bus. We got stuck in a traffic block somewhere near Ambalappuzha (2049hrs) – there was an accident ahead. The crew rushed to see the status – but saw that things were undercontrol. Some 10 minutes later, police had cleared one side of the road and permitted vehicles slowly. The bus pulled over for dinner break at a small hotel near Punnapra EB station – at 2109hrs. It was one really small hotel. A Viji-Yathra B9R was already parked there. The hotel had very few seats remaining – I managed to find one. The food was above-average, but the overall cleanliness at the hotel left a lot to be desired. The service was lousy as well. The toilets weren’t clean, nor were they properly lit. I finished off my food and rushed out of the hotel at the earliest – the crew were already back and ready to start off! The Viji bus was still there – SRM B9R was also parked (they had reached about 5 minutes behind us). We started off at 2131hrs – that was a 22 minute break. Really appreciate the punctuality of the crew – no time was wasted hanging around. We stopped outside the Alappuzha Agent’s office at 2148hrs – but no passengers joined. We overtook the Viji B9R soon after Alappuzha (they overtook us when we stopped at Alappuzha). The driver picked up speed after Alappuzha – he meant business after we entered the 4-lane road at Cherthala. The driving was controlled – he did not hit three-digits at any point of time. We stopped at Vyttila (Skyline Travels) at 2238hrs. Two passengers joined, and the bus left at 2240hrs. We travelled through the bypass and turned left at Palarivattam junction. The bus headed towards Kaloor stadium – picked up a passenger from there at 2248hrs. I slept off after Kaloor – slept really well. I woke up when the bus stopped at Thrissur (2345hrs) – some 5 passengers got in. Lights were not switched on, but the attendant came around with a small torch and showed the seats. We had a total of 37 passengers now. The second attendant got off after Thrissur – he, in fact, came up to me and said bye before getting off (I was awake at this point). I slept soon afterwards. Woke up briefly when the bus stopped for diesel – it was at the usual fuel station near Madukkarai. The bus was just starting off then – the time was 0215hrs. I was a bit concerned now – the bus could be late at Bangalore. The worries did not affect my sleep though – I was fast asleep even before the bus reached the first toll on Coimbatore bypass. I woke up again as the bus left a toll station (Kumarapalayam, near Bhavani). The bus was picking up speed at a rapid pace – I switched on the GPS. The reading hovered around 120kmph, peaking at 127kmph. I slept off again. I woke up as the bus was exiting from the Rayakkottai road, and re-joining the highway outside Hosur. 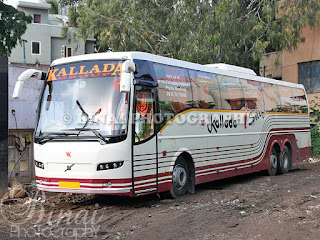 The Kottarakkara-BLR bus of G4 was also along now. The windows of our bus was all fogged up – it was hotter inside the bus compared to outside (The temperature inside the bus was very comfortable – and it was biting cold outside). The time was around 0600hrs now. OH! 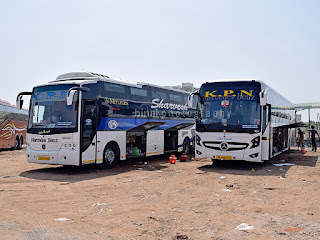 The driver had covered a really long distance over the night – but the driving was really good, since I did not wake up at any point of time, even when the bus was running through the two-laned winding roads through Rayakkottai. Attibelle toll was less messy than I expected. We stopped at Hebbagodi to drop a passenger (0622) and again after Electronic City toll (0626). The bus took the elevated highway from there. I got off my seat and headed to the cabin a while after we got on to the highway. As I got up, I saw the foreigner curled up on the last row sharing space with the first driver. I congratulated the driver for his excellent drive - he was a bit upset of the bus being somewhat late. I was dropped at Silk Board at 0633hrs. It was chilling cold outside (newspapers reported that morning to be coldest of the season – at 13*c). Concluding remarks: The bus, KA-01-AB-6543, had about 35K kms on the odo. 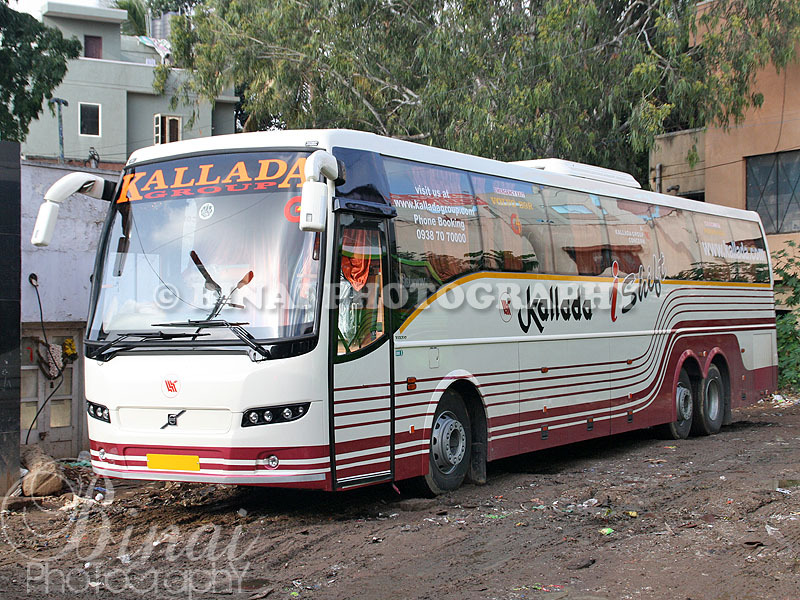 This was the first iShift bus of Kallada G4 – I was fortunate to be present for the post-delivery pooja ceremony of this bus. The Bangalore-Trivandrum services of Kallada G4 are considered very prestigious, and the service certainly stands up to its name. The crew were really well behaved – they handled that foreigner really well. They did not turn aggressive at any point of time, nor did they misbehave with him or make fun of him. The driving was really good – they were not rash anytime. They maintained timings really well without being rash. There were a couple of instances of hard braking in the Trivandrum-Kollam stretch. I am really not a fan of iShift – atleast I did not feel it is something better than manual transmission. There was a very pronounced rubber-band feeling. The shifting was a bit noisy though. The journey took 13 hours and 17 minutes – covering a distance of over 750kms. That is an average of a shade over 56kmph – a significant proportion of the distance was in 2-lane roads. I’ll try the Nagercoil route the next time. Will I take this service again: This question is now redundant for Kallada G4 – ‘M lovin’ it! I am longing for my next journey with them. Yesterday morning, this guy decently overtook me (I was on my bike) on the Kottayam Road-the crew controlled the bus excellently, especially through sharp curves! Seems they mix up the buses frequently!